The Backlands are a glacially sculpted terrain, with features such as erratics, whalebacks and drumlins. Granite and “bluestone” metamorphic rocks were once quarried in Purcell’s Cove, for buildings and fortifications. Geologist Marcos Zentilli prepared these note for a set of Jane’s Walks into the Backlands on May 3, 2014. Inventory of Geological Values in the Vicinity of Colbart Lake, Nova Scotia. Report by Chris Miller, 1997. A Report to The Williams Lake Conservation Company (Feb 13, 2014): The Williams Lake Conservation Company has issued a report which documents the plant communities of the Williams Lake backlands. 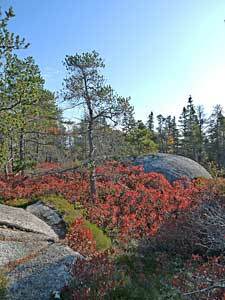 Prominent amongst them: the rare, Jack Pine/Broom Crowberry barrens. “While the survey focused on these lands, many of the findings apply to the larger Purcell’s Cove Backlands. It is noteworthy that the authors advance some novel perspectives on the ecological values of the area. The issues of fire management and wetland protection require attention and discussion by the larger community” says Kathleen Hall of the WLCC. Presentation by Nick Hill and David Patriquin to the Wildland Fire Canada 2014 Conference. Photo-essay by Richard Beazley and David Patriquin. The Mclntosh Run: Environmental Resource Analysis for the Wildlands Working Group and the citizens of Mainland South In Halifax County. Project Report by Huan Liu, Dalhousie School of Planning, 2012. This project tested several remote sensing approaches for documenting vernal pools by employing them individually in mapping potential vernal pools in the undeveloped area of the central Williams Lake Watershed. Field observations examined the accuracy of the predictions and an evaluation of the methods and data that this project used. David P paddles the shoreline on June 20, 2015 and comments on what he sees. Report to Williams Lake Conservation Company (WLCC) by David Patriquin, Jan 6, 2016. There is evidence for delayed (or possibly absence) of the fall turnover of the water column in Williams lake which may be related to salt induced stratification. Conditions have clearly deteriorated since 1990/1991. Even though three-quarters of the watershed is undeveloped, salt inputs from the other 1/4 are having significant impacts on the health of both Colpitt Lake and Williams Lake. Williams Lake, Halifax. Nova Scotia: An Investigation of the Aquatic Ecosystem of an Urbanizing Watershed [1991/1992]. Report by R. Scott to Nova Scotia Department of the Environment, 1992. 39 pp. The document includes detailed bathymetry; vertical profiles of temperature, electrical conductivity (salinity) and pH observed in 1990/91; nitrogen, phosphorous and chlorophyll; and contrasts these observations with those of earlier studies during a period of higher salt and nutrient loading. Technical evaluation of the Halifax Harbour Cleanup Inc.: Environmental assessment report for the Halifax-Dartmouth Metropolitan sewage treatment facility. A Biophysical Survey of the Williams Lake-Purcell’s Cove Backlands, Halifax County, Nova Scotia. Summary of Findings and Recommendations following from Studies of the Biophysical Character, Cultural Significance and Recreational Use of the Purcell’s Cove Backlands. Prepared for the Williams Lake Conservation Company by Patricia Manuel and Martin Willison. 1993.